Although the Bornean orangutan (Pongo pygmaeus) shares 97% of our DNA, it is a highly endangered species due to habitat destruction, indiscriminate hunting and the illegally captured orangutans are taught how to survive in the natural environment and subsequently reintroduced to protected habitats. Sarawak has been rehabilitating orangutans since the 1970s, but it is an expensive and time-consuming process. This unique initiative allows busy people to gain a deeper understanding of the challenges faced and to actively participate in orangutan conservation by compressing a variety of education and conversation activities into a single day. it is ideal for associations and corporate groups, as well as families with older children. 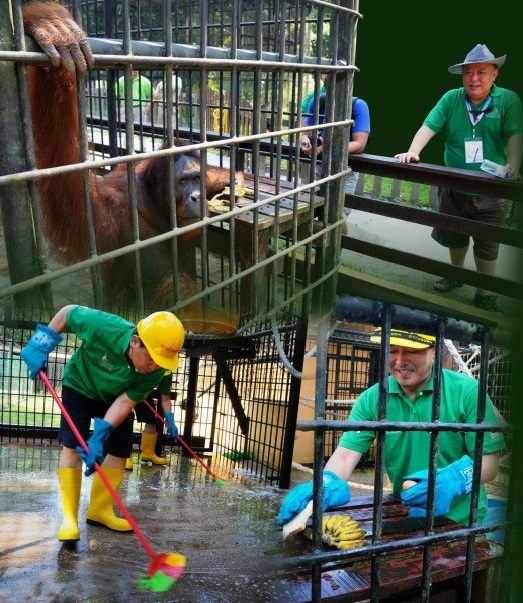 Participants learn from a dedicated team of Sarawak Forestry experts about the challenges of orangutan rehabilitation, get to work hands-on performing everyday conservation activities at Matang Wildlife Centre, then transfer to Semenggoh Wildlife Centre to see the result of successful orangutan rehabilitation. All participant receive a certificate acknowleging their contribution to Sarawak’s orangutan conservation programme.